Eunice and Ron Shanahan have shared with readers of the Victorian Web this material from their website, Letters from the Past. Click on thumbnails for larger images. This letter from the past was written by Charles Parke, an angry man of strong religious convictions, to Jeremiah Duke in New Park Ballymote Ireland. Ballymote, Sligo, has a long and colourful history. The name means Homestead of the Mound, from the Gaelic Baile an Mhota. It has the ruins of the Franciscan Friary where the fourteenthth-century Book of Ballymote was written. This document, which supplied the key to the ancient Ogham script (used for writing the Irish and Pictish the Duke family of New Park do not seem to have made the headlines as the Dublin Archivist advised me that they have no records of them. I have another letter in my collection addressed to Robert Duke at the same address — possibly the father of this Jeremiah — dated 1803, so they were there for a number of years. The mail service to Ireland was initially by sailing packets and during that time there were occasions when as a result of the weather conditions all the vessels were on one side of the Irish Sea or the other. So in 1821 steamships replaced the sailing packets. One steamship route was from Liverpool to Howth, and then by road to Dublin, where letters were sorted and sent out for delivery. The time taken for the passage across the Irish Sea varied but during the early years of operation averaged 7½ hours. Twenty years later the service would still have depended on the vagaries of the weather and other unforeseeable calamities. For this letter, the postmarks show it was despatched from Liverpool 15 January 1831,(provincial datestamp type in use from 1829) and arrived in Dublin the next day as shown by the double-framed diamond datestamp in red AM 16 JA 1831 - type in use from 1815-1846 . The charge shown as a black manuscript 1/3 is a mystery. The rate at the time was the land cost at both ends plus the 3d packet rate. The land cost from Dublin to Howth was 9d for the 103 miles, added to the 3d makes 1 shilling, so if any reader can explain the 1/3 charge, I would be pleased to hear from them. The seal on the letter is quite unusual, being of a paling fence of 5 uprights, against a tree in full leaf with what looks like a fox running between the fence and the tree. And now to the letter, which is 'crossed' making it very hard to read initially, but practice makes perfect! 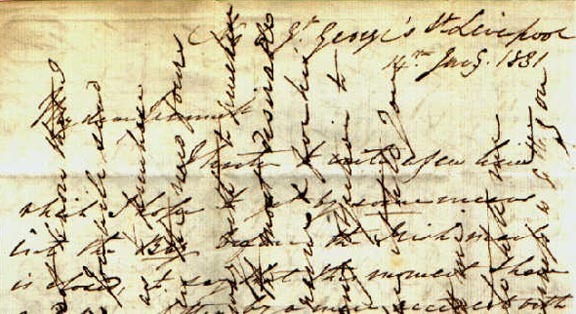 The letter begins normally, that is the first page follows on to the left part inside the letter, then continues onto the right hand side - then the outside two 'ears' or 'wings' of the letter. As he has more to say he turns the letter over and 90 degrees to the right, and continues writing across the front page, continuing across the inside two pages. In order to read it, you must concentrate on the line you are reading, and ignore the words written underneath. It was very messy, but it saved having to pay double postage. In the first paragraph, the writer gives an insight into the workings of the post office at the time, showing that he was aware of the times of the mails. I hasten to write a few lines which I hope to get by some means into the Bag before the Irish mail is closed, to say that this moment I have recd your letter by a mere accident with its Enclosures from which I feel much obligd. When I again called at the office yesterday I found no letter, I made up my mind to write to Messrs Wright, London on whom I knew the order would be due, to beg of them to stop it if presented. However I got my letter back out of the P. Office, as no post leaves here for London on Fridays and it consequently could not leave Liverpool sooner than this evening. " Note : the 14th January was a Friday and I like the idea of his going to the Post Office to get his letter back before it left in the night mails to London. The next paragraph is another comment on the postal service, but again he has come out the winner! "I fear you have been uneasy and put to trouble since I wrote to your Father in which letter I requested he write to you to write to me. The excuses made by the P. Office was that this address which was written in a big and male hand was so defaced by the daub of a postman when it was recd in Dublin that they did not know for whom it was, but when they showed it me I knew it and proved my propriety to it - when they gave it me with many apologies then." The next part of the letter refers directly to the turmoil in Ireland over Catholic emancipation and his strong belief and faith in the Lord. "I was truly sorry to hear about the violent state of things in our poor Country owing to a few wicked individuals. I suppose the Govt. have got their eyes opened at last as to whom are loyal and otherwise, they have been the great cause nearly of all the evils that they now see besetting. We may well be tired looking for relief from a man from whom we are warned to "cease" and whose Truth is in his nostrils. Happy are those alone in times of dismay and distress whose trust is in the Living God. I long to realize a more abiding trust in Omnipotent who, blessed be his name, reigneth over all, and will fulfil all his counsel. Luke has declared that whosoever believes in the Lord Jesus Christ shall be saved, there is no other Salvation for us sinners nor do we want any other. The nature of Jesus is a strong Tower of Refuge for those who have faith to enter therein. That we may all be given this saving faith my dear Jeremiah is my prayer, however feeble, you are happy to hear." Note: I cannot make sense of the part of the sentence 'looking for relief from man from whom we are warned to "cease" and whose Truth is in his nostrils' This cannot be the Duke of Wellington (although he had a large nose! ), as he was no longer Prime Minister - perhaps it was a comment on the new Home Secretary, Lord Melbourne. He then goes on to family and finance matters. The debentures he mentions were a form of investment much favoured for their stability and security. The 'new fours' means they were issued at 4%. "The news I wrote to your Father of poor John I have none to add to it at present. I am rejoiced to learn you are all so well. I often think of your friends and those about you. I thank you for my acct which is entirely satisfactory, I did not know that I was so rich, perhaps you will send "Lananye" as much as to purchase a hundred debentures in this new fours, and if they are done away with to purchase stocks in some other - the most desirable in Jennett’s Parke’s name and for her act. If you see any objection to that you can defer it till you communicate with me. When you write tell me how your business is getting on. If there was anything of an unpleasant or rather more unpleasant nature likely to occur in Ireland I shd be glad to hear as in that case (which I trust will be avoided) I should feel it a duty to be on the spot, even tho’ my presence would not be of any use, it will be satisfactory to myself. Should you have any time to write me a line I shall be obligd when you can give me any hints you feel necessary. With respect to the choice of tenants I feel quite satisfied and thankful for your selection." Note: His final paragraph is a comment on contemporary England. The country was in uproar concerning electoral reform and there was rioting and violence in various parts of the country, until the Reform Act was finally passed in 1832. I fear you will not be able to read this letter, such haste as I had written with. The state of this Country is deplorable not much better than Ireland, nothing short of revolution will content the unruly people and Rebellion is stalking through the Land. I am sorry to say it is by no means confined to the lower orders that this evil spirit is manifested. This letter was written at a time of turmoil and political upheaval. 1830 had been a year of unrest in Europe. In July the French dethroned their King Charles X, and replaced him with his popular cousin Louis Philippe, Duke of Orleans; the Poles rose against the Tsar Nicholas; Italy and Germany had their troubles and there was open war in Belgium and Portugal, in fact, riot and insurrection was the order of the day. A contemporary account like this shows how the people were affected. It seems 1831 was going to be no better. "You ask for comment on the charge of 1/3 and then quote the cost from Dublin to Howth as 9d for 103 miles. I can't argue about charges but something seems wrong here. The distance from Howth to Dublin is about 10 miles perhaps a little more as the horse went. Present day maps give the shortest distance Liverpool to Holyhead as 92 miles, but I expect that, as the road went then it probably was 103 miles. So could the 1/3 be 9d from Liverpool to Holyhead, 3d for the packet and 3d Howth to Dublin?" This shows how easy it is to write something and mean something else. As W.S. Griffith says the distance from Howth to Dublin is only 10 miles, but I had calculated the whole distance including the sea journey! The second letter was from Chris Barling in Victoria. I have quoted his letter in full, since he explains several of my questions. I think I can clear up your puzzle concerning the man from whom we are warned to cease". The writer is clearly a Protestant who knows his Bible very well and assumes that his recipient does as well, because this section of his letter is largely based on scriptural quotation. I know Bible-loving people who still write and speak to each other this way: to outsiders it seems like a code or a sort of game, but to them it is just sharing precious ideas in a readily recognized and condensed form, and also a sort of mutual encouragement. I am almost certain that you misquote the text: "We may well be tired looking for relief from a man from whom we are warned to cease, ..:": I think you will find that the text indicates that the reference is not to "a man", a particular person, but to "man", to humankind in general. The text is in fact a reference to the prophet Isaiah, in the Authorized Version of the Bible chapter 2 verse 22, "Cease ye from man, whose breath is in his nostrils: for wherein is he to be accounted of?" This is intended to be a rejection of human solutions to problems and an admonition to turn instead to God, which the writer I suspect takes to mean we should keep out of politics and rely instead on prayer — a position often taken by conservative religious people, which usually means that they in effect support the status quo. Certainly in this case the writer is horrified at the unrest caused by the whole Reform question, and the particular agitations occurring in Ireland ("owing to a few wicked individuals"), and just wants to put the whole complex of issues aside. In the original "whose breath is in his nostrils" is just a bit of primitive anatomy: "breath" is "spirit", and all he is saying is that human spirit is a temporary thing, depending on our staying alive and breathing, whereas God's spirit is eternal and unchanging. "Truth" here is either a misreading of the script on your part or a misquotation by Mr Parke, which is common enough when writing from memory. Also, Parke says 'Luke' rather than 'St Luke', it indicates he is something of a non-conformist rather than Church of England, or else deeply evangelical. I suspect this is another hasty error on his part, because the "quotation" is much more like a text from St John, but the matter is open to question. David Robinson, Postal History of GN & Ireland. R.M. Willcocks, History of England. Charles Oman, Great Britain Post Roads Post Towns and Postal Rates 1635-1839. Alan W Robertson, AA Touring guide to Ireland.